Good writers make their writing interesting and lively by using a variety of sentence structures. As you will see in the packages on linking, cohesion and coherence, too many simple sentences can make your writing disjointed, unconnected and childish. On the other hand, too many long complicated sentences can be difficult to write and confusing for the reader. A simple sentence contains a subject and a verb. A simple sentence is also often called an independent clause because it can exist on its own without anything else. The clause may also contain an object or a complement. An object is the thing or person affected by the subject (e.g. My boss fired me). A complement describes the subject (e.g. I felt sad), or the object (e.g. (He made me angry). SV, SVO, SVC, SVOC, SVOO. SVO She had bought a new phone. SVC Her phone was great. SVOC It made her pleased. SVOO She gave it to her brother. I bought a new phone but it didn’t work. I didn’t call as I couldn’t get a signal. Peter was really bored so he sent me a text message. A complex sentence is a sentence with one independent clause and at least one dependent clause. A dependent clause is a clause that cannot exist on its own. A complex sentence is often used to make clear which ideas are most important, and which ideas are less so or subordinate. When he arrived for the exam , he handed in his mobile phone. After she won the match , she called her parents. Since you’ll be here for a few days , I suggest you get a local sim card. That’s the man who found my phone in the taxi. I was late because of this stupid phone. A complex-compound sentence or compound-complex sentence is a sentence with at least two independent clauses and one or more dependent clauses (also known as subordinate clauses). Elly has a Nokia, but Megan, who earns more money, has a Samsung. Read the following sentences and click which type they are. Read this article on flexible mobile phones and identify the sentence types numbered by clicking on the correct answer in the table. Imagine treating your phone like a piece of paper. Roll it up. Drop it. Squish it in your backpack. Step on it - without any damage. 1. Researchers are working on just such handsets - razor-thin, paper-like and bendable. There have already been prototypes, attracting crowds at gadget shows. But rumours abound that next year will see the launch of the first bendy phone. Numerous companies are working on the technology - LG, Philips, Sharp, Sony and Nokia among them - although reports suggest that South Korean phone manufacturer Samsung will be the first to deliver. 2. 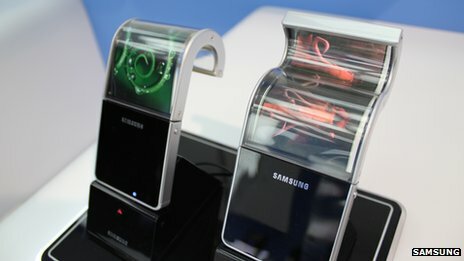 Samsung favours smartphones with so-called flexible OLED (Organic Light Emitting Diode) technology, and is confident that they will be "very popular among consumers worldwide". Their screens will be "foldable, rollable, wearable and more, [and] will allow for a high degree of durability through their use of a plastic substrate that is thinner, lighter and more flexible than… conventional LCD technology," says a Samsung spokesperson. 3. There are other technologies that could make your smart phone bendy. After all, the concept - creating flexible electronics and assembling them on equally flexible plastic - has been touted since the 1960s, when the first flexible solar cell arrays appeared. In 2005, Philips demonstrated the first prototype of a rollable display. And it may not have been obvious, but a couple of years later, flexible technology hit the mainstream. 4. Amazon's first Kindle e-reader used a plastic non-rigid screen, known as an optical frontplane, to display its images. The only problem was that the components beneath it required the device to be stiff. Like many of the e-book readers that followed, it used e-ink - an innovation developed by a US company of the same name. The screens are black and white, and work by reflecting natural light instead of glowing themselves, mimicking the way text looks in paper books. "There are about 30 million flexible e-ink displays in the field today - the oldest working ones are from 2006," says Sri Peruvemba of E-Ink. 5. "They [are] well-suited for simple phones, memory and battery indicators, smart credit cards, wristwatches, and signs." But why are most e-ink displays hidden behind a rigid glass screen and not made bendy? 6.One reason is cost, says Abhigyan Sengupta, an analyst with consultancy firm MarketsAndMarkets, which recently published a global study on flexible displays. To have a fully flexible finished product, both parts of the display have to be flexible - the optical frontplane and the backplane, where transistors are - as well as the device's battery, the outer shell, the touchscreen and other components. 7. Although Mr Peruvemba says his firm has started manufacturing displays with flexible backplanes in-house, its many partners are also busy researching ways to make electronic paper as flexible as the real thing. 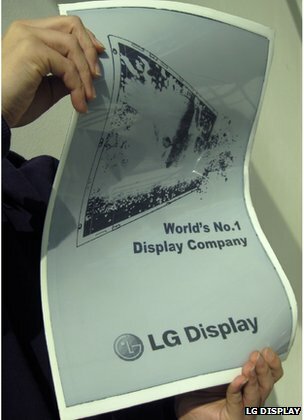 Among them is South Korean firm LG Displays, which has just begun mass-producing fully flexible e-ink screens. "They could prove a terrific benefit for handsets, where damage from drops is common," says an LG spokeswoman. "Their light weight and thinness should provide huge potential to the future of handset design development." 8. 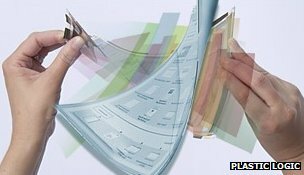 Another company working with E-Ink is UK firm Plastic Logic. 9. It uses the US firm's optical frontplane but adds on its own backplane made out of non-rigid plastics, and then sells the part to device-makers. 10. 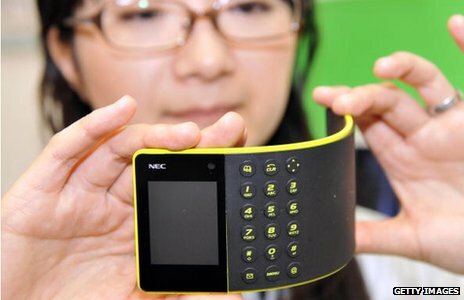 Last May, Plastic Logic demonstrated a paper-like flexible screen capable of playing video in colour, which is achieved by placing a filter on top of the original black-and-white display. 11. But the colours are not as bright as on other types of screens, and the company's research manager Michael Banach acknowledges the technology at the moment is most likely to be used as a back-up screen which kicks in when batteries run low, rather than the main display. So other researchers are taking a different approach. Clad in blue lab overalls, 12. Prof Andrea Ferrari from Cambridge University works on future bendy displays using graphene. The material was first produced in 2004 by Andre Geim and Konstantin Novoselov, two Russian-born scientists at the University of Manchester. 13. Graphene is a sheet of carbon just one atom thick yet it is stronger than diamond, transparent, lightweight, has great conducting properties and is flexible. Researchers believe that graphene may in future replace silicon and revolutionise electronics as we know it. "We are working on flexible, bendable and transparent displays and surfaces that could in future be part of flexible phones, tablets, TVs and solar cells," says Prof Ferrari, who is working with Finnish phonemaker Nokia. 14. "Samsung is really quite advanced in this field, but we here in Cambridge have done some great work on Nokia's prototypes as well." 15. He says that graphene will complement and highly enhance the performance of OLED-type flexible phones, because in theory, even a handset's flexible battery can be made out of this material. 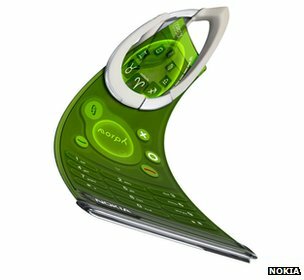 Whatever the technology, it seems certain that very soon our phones will be not just smart, but bendy too. Now click on the correct answer in the table.